What Else Could You Use Besides Cream in Alfredo Sauce? Can You Use Flour to Thicken Chili? Many chili recipes call for flour as a thickening agent. 4 What Else Could You Use Besides Cream in Alfredo Sauce? 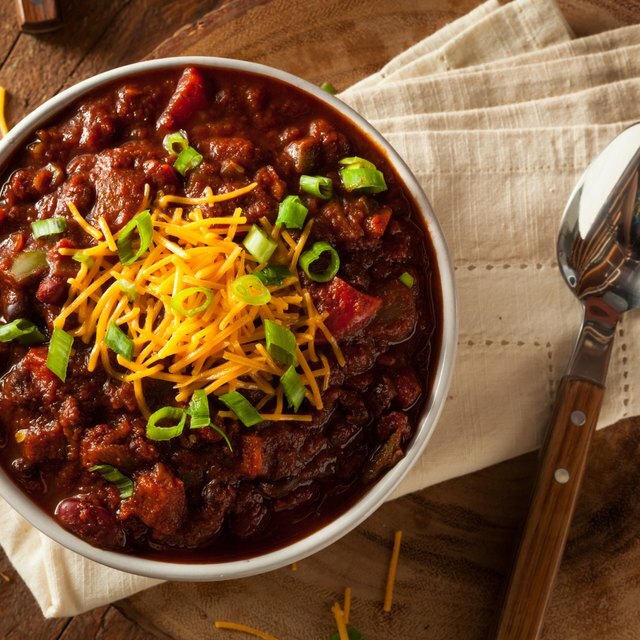 Chili is the perfect winter meal: warm, thick, hearty comfort food conveniently cooked in one pot. Everyone has a favorite version, and texture is key -- thicker than soup, less chunky than stew, it's important to get the consistency right. Using flour as a thickener allows you to go no further than your pantry, and knowing several methods means you can adapt and experiment with your favorite recipes. A roux is a mixture of flour and fat cooked together. Make a roux at the beginning of a recipe, mixing 1 part flour with 2 parts fat -- either oil, butter or bacon drippings -- in a saute pan. Stir constantly to prevent lumps. Proceed with making the chili. You would typically add vegetables and garlic, then the meat, top the meat and vegetable mixture with spices, pour stock over it, and simmer until the chili thickens. A slurry is an uncooked mixture of flour and liquid, incorporated at the end of the cooking. Depending on the thickness you want, mix 1 to 4 tablespoons flour with 1 cup hot liquid, either broth or water. Pour the mixture slowly into the pot as you whisk the chili, and continue stirring until it thickens. This process ensures even blending without lumps. 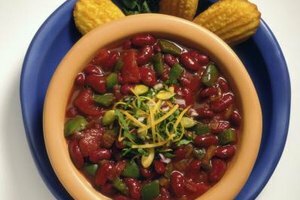 If your chili is relatively thick already, add 1 tablespoon flour and simmer for 10 minutes to get a richer consistency. A roux is usually made with flour. You can also consider making a slurry with masa,. Made from dried corn, masa has a corn taste that complements the flavors of chili. The taste won't get lost because you add it at the end of cooking. Another option is cornstarch, added either at the beginning or the end of cooking. Flour, masa and cornstarch are grain starches and give an opaque look. They thicken quickly but at relatively high temperatures. Because a roux is made first, it's best to use a recipe that includes this step. You can a slurry whether or not your recipe calls for it, depending on how thick you like your chili. Do not thicken the same pot of chili with a roux and a slurry made of flour -- this can prevent the four from thickening properly. When making a roux, stir continuously and immediately add the next ingredients once flour and fat are combined. This prevents burning. Based in Chicago, Ginger O'Donnell has been writing education and food related articles since 2012. Her articles have appeared in such publications as "Dance Teacher Magazine" and "Creative Teaching and Learning." In addition, Ginger enjoys blogging about food, arts and culture on swirltocoat.com. She holds a Bachelors of Arts in Performance Studies from Northwestern University and a Masters of Arts in Teaching from Webster University. How Do I Thicken Curry? Why Does My Homemade Ice Cream Not Freeze?